Mobile is the proud home of SouthSounds Music & Arts Festival! Founded in 2011, SouthSounds Music & Arts Festival is the first festival in the country dedicated to showcasing the best emerging and independent Southern music and art. 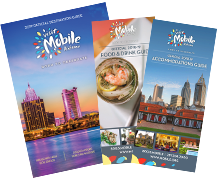 You can get information of lots of great hotel and lodging options and take advantage of discounts for SouthSounds attendees at our Places to Stay.